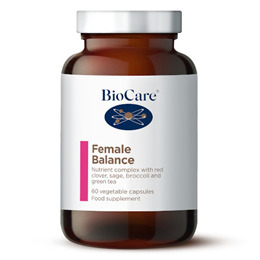 BioCare Femforte Balance is a potent mix of botanical extracts, suitable for women during and after childbearing age. It contains high levels of red clover, providing a natural source of isoflavones genistein, daidzein, biochanin, and formononetin. Red clover provides a natural source of isoflavones. Broccoli and green tea contain potent antioxidants. Suitable for women during and after childbearing age. Red Clover Standardised Extract (Trifolium pratense Ariel Parts), Broccoli Powder (Brassica oleracea L. var italic Floret), Beetroot Extract (Beta vulgaris Root), Potato Maltodextrin,, Capsule Shell (hypromellose), Broccoli Standardised Extract (Brassica oleracea L. var italic Sprout),, Green Tea Extract (Camellia sinensis Leaf), Bulking Agent (Cellulose), Anti-Caking Agent (Magnesium Stearate), Citric Acid. Take 1 vegicap twice daily with food or as professionally directed. 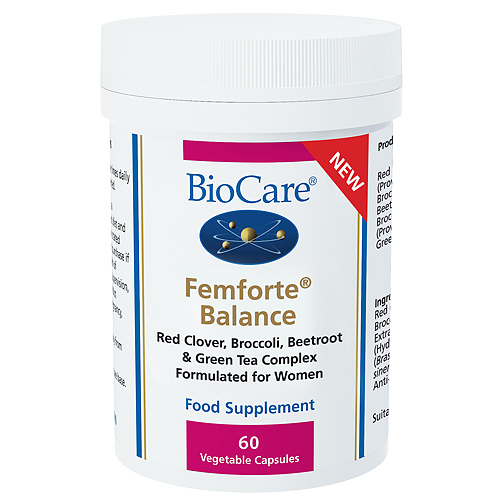 Below are reviews of Femforte Balance - Red Clover - 60 Vegicaps by bodykind customers. If you have tried this product we'd love to hear what you think so please leave a review.